We have had a fabulous time in Zermatt. Great food, unbelievable beauty, fun transportation (who can resist a train that goes to 10,000 feet? ), good exercise. Here is a small fraction of the pictures we took in the past two days. Tomorrow, on to the Lauterbrunnen Valley! 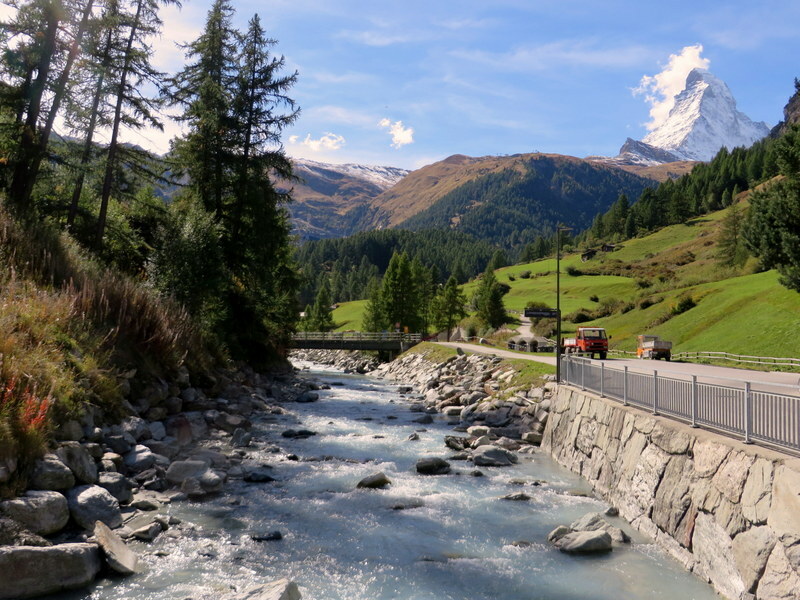 This section is about our trip to the Gornergrat, reached by narrow-gauge train. 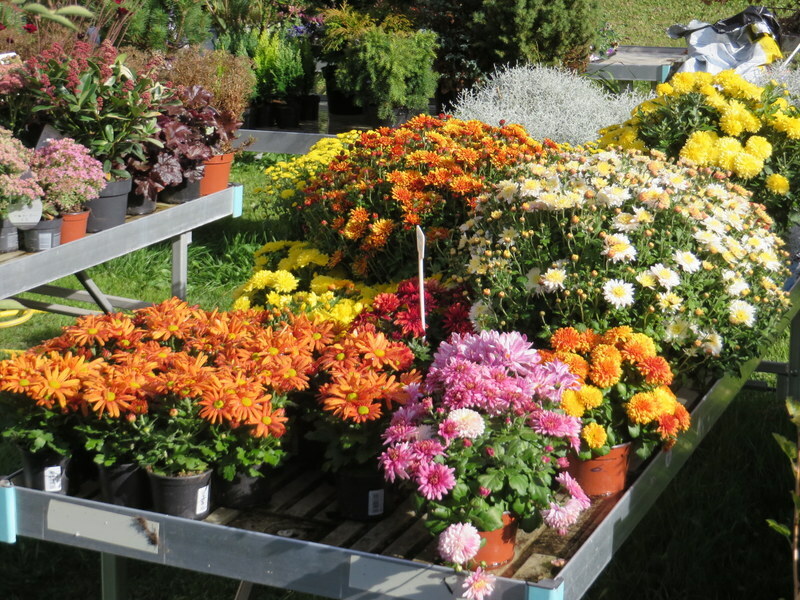 Hover above any picture to see the caption, or click on any picture to start a slideshow. Hikers in front of THE mountain. Wooli & me at 10,135 feet, on the Gornergrat. Nice view for a meal. Sunny and about 45 degrees Fahrenheit. Kulmhotel at the Gornergrat. 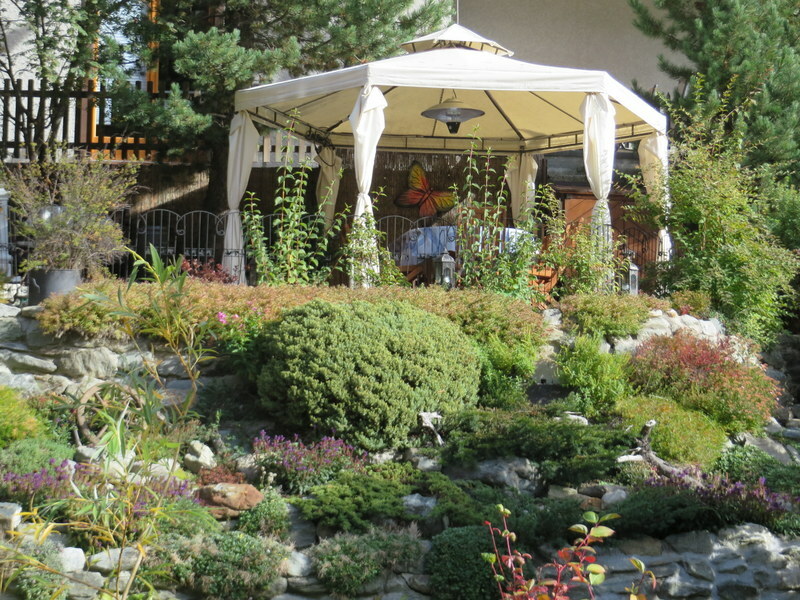 335.00 CHF (about $342) buys one night in a room overlooking the Matterhorn. Meals sold separately. Again at the Gornergrat. We arrived by train! The next day we rode gondolas to Furi and Trockener Steg, then hiked around Furi. Hover above any picture to see the caption, or click on any picture to start a slideshow. Our tranportation to the Trockener Steg. Normal crowd in a gondola. All alone in the gondola going down. Long long bridge. Fun to walk across! Ric on the suspension bridge. 25 years ago he would not have walked across such a thing. Wooden path across stream and bog, Furi. We walked through their pasture. Furi Suspension Bridge, 100 meters long, 90 meters above the gorge. 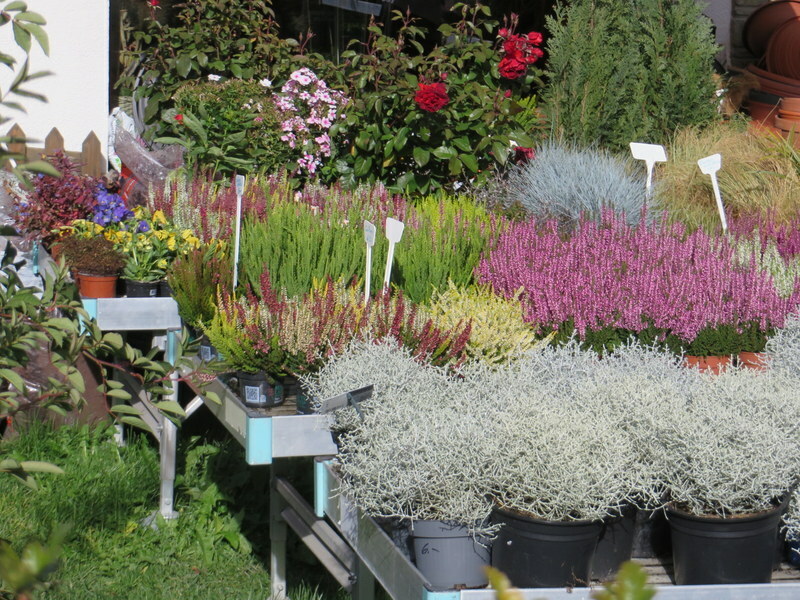 This “Glacier Garden” allowed us to hike among potholes left by the glaciers. The one in Taylors Falls, MN is more impressive, although not at high altitude. 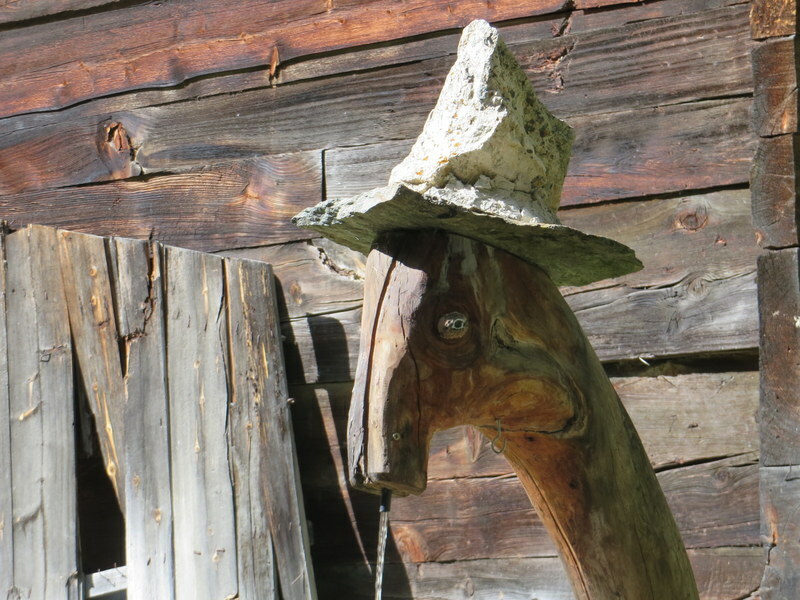 Here a few miscellaneous pictures around Zermatt. 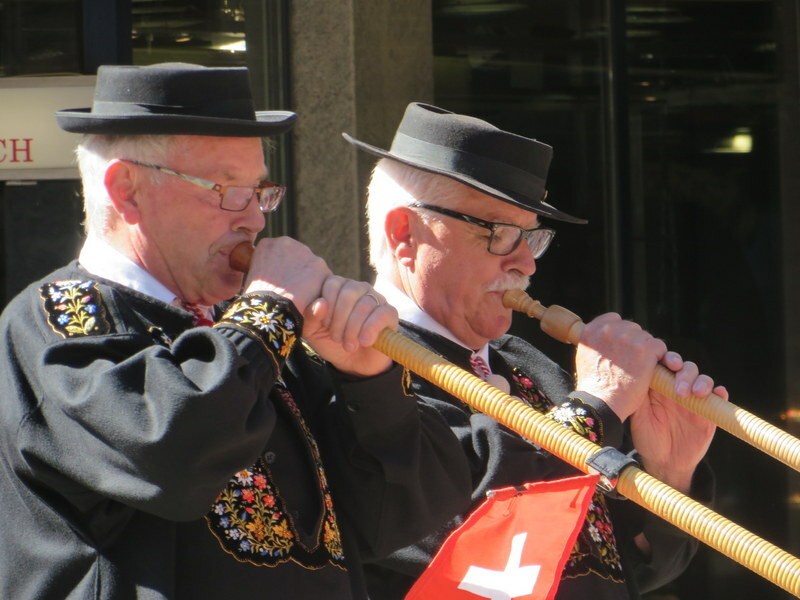 Local color: alpine horn players in Zermatt. 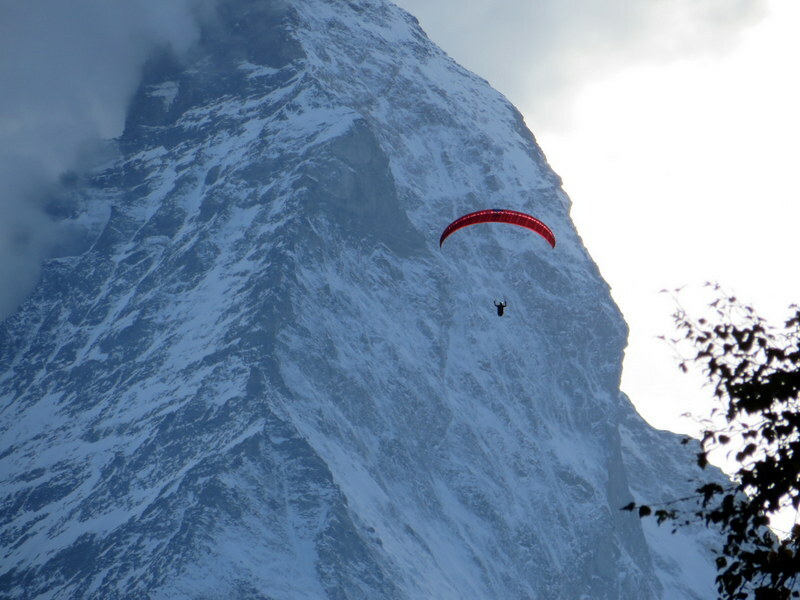 Sunset paraglider in front of the Matterhorn. 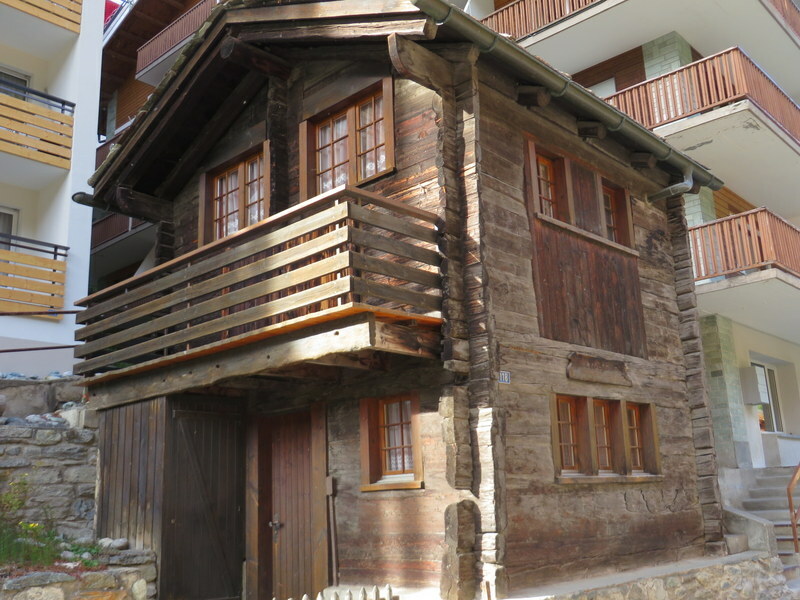 Zermatt has left many of the old-style huts and houses. Looking up river. Love this view! I do not think I’ve ever experienced the beauty captured in these photos. Seeing the hikers right in front of THE mountain is spectacular. What a journey. I loved seeing those guys in front of the mountain and hope we looked like that on occasion! Up next (as soon as I have a free hour; too busy drinking post-hike wine right now) is teh Jungfrau, “Top of Europe.” What a trip that is!! All these pictures are breath taking. Such beauty. The old style house/hut reminded me of similar places we stayed in 1965 in Austria, Switzerland and Italy. Typically a family lived there and we rented bedrooms. Those were interesting travel days, Carolyn! My college friend and I stayed in several places where we rented “the spare room.” Not like today’s B&Bs where the host/hostess probably does not even live on site! And that is where I discovered how very good warm milk is in coffee! Lattes?